For a casually elegant getup, choose a dark brown blazer and beige chinos — these pieces the place of work beautifully together. 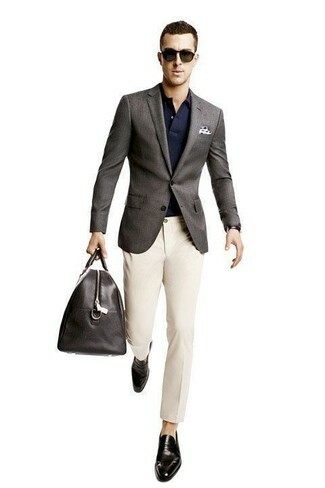 When it comes to shoes, this outfit is complemented wonderfully with black leather loafers. As you can see here, being a dapper dude doesn't take that much the office. 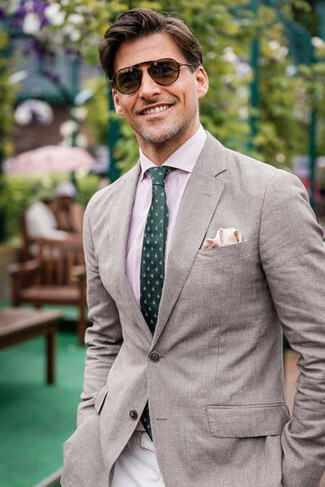 Just consider teaming a mint double breasted blazer with Bills Khakis m3 straight fit tropical poplin pants from Nordstrom and you'll look amazing. 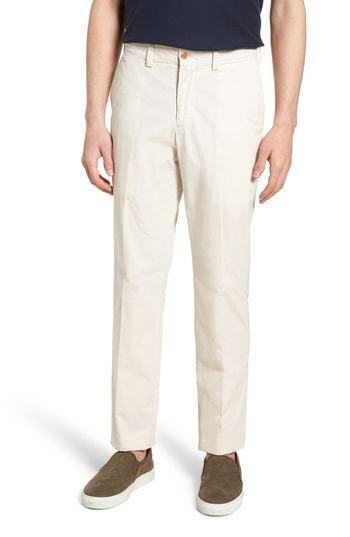 If you're on the lookout for a casual yet stylish getup, marry a beige short sleeve shirt with Bills Khakis m3 straight fit tropical poplin pants. Both pieces are totally comfortable and will look great paired together. When it comes to footwear, this getup is finished off nicely with white leather low top sneakers. For a casually elegant ensemble, make a light blue check dress shirt and beige chinos your outfit choice — these pieces play really well together. As for the shoes, opt for a pair of dark brown leather loafers. This combination of a grey blazer and Bills Khakis m3 straight fit tropical poplin pants is very easy to throw together in no time flat, helping you look amazing and ready for anything without spending too much time searching through your arsenal. For a smart casual ensemble, choose a tan blazer and Bills Khakis m3 straight fit tropical poplin pants — these items a work setting pretty good together. Want to go easy on the shoe front? Rock a pair of grey low top sneakers for the day. 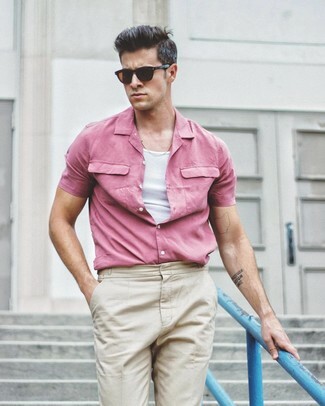 If you're on the lookout for a casual yet dapper ensemble, try teaming a pink short sleeve shirt with Bills Khakis m3 straight fit tropical poplin pants. Both pieces are totally comfortable and will look great together. 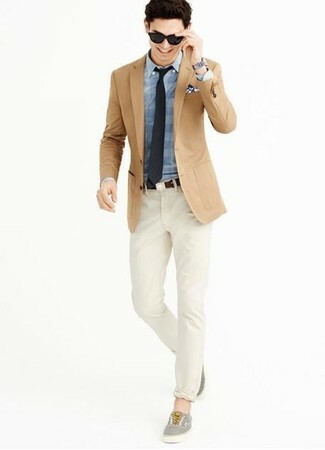 If you're on a mission for a casual yet dapper getup, go for a blue denim jacket and beige chinos. Both pieces are totally comfortable and will look great together. A cool pair of brown leather tassel loafers is an easy way to upgrade your look. 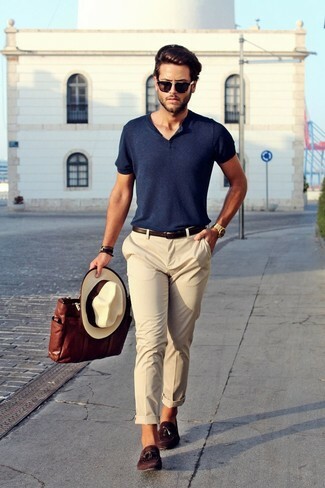 If you're after a casual yet seriously stylish ensemble, try teaming a navy henley shirt with beige chinos. Both garments are totally comfortable and will look great together. 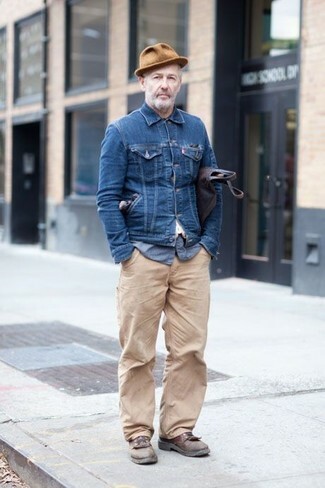 Let's make a bit more effort now and throw in a pair of dark brown suede tassel loafers.